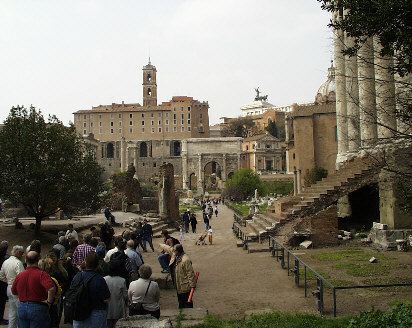 The Roman Forum is located in a valley that is between the Palatine hill and the Capitoline hill. It originally was a marsh, but the Romans drained the area and turned it into a center of political and social activity. The Forum was the marketplace of Rome and also the business district and civic center. It was expanded to include temples, a senate house and law courts. When the Roman Empire fell, the Forum became forgotten, buried and was used as a cattle pasture during the Middle Ages. Picture taken looking at the Forum and the arch of Septimius Severus. Much of the forum has been destroyed. Columns and stone blocks are all that remain of some temples. The arch of Titus and the arch of Septimius Severus still stand and are in good shape. Like many other ancient Roman buildings, stone blocks have been removed from the Forum and used to build nearby churches and palaces. 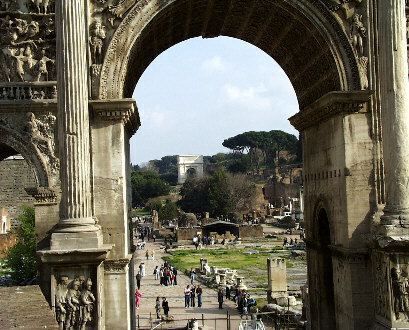 Picture taken looking at the forum through the arch of Septimius Severus to the Arch of Titus.